The TSA says the unassembled parts of a defunct grenade launcher and a replica grenade were found on Monday, March 4, 2019, when an alarm went off as the bag passed through security equipment at the airport, about 60 miles north of Philadelphia. The man, from St. Augustine, Florida, was stopped by police and told officials he thought he could bring the non-functioning launcher onboard in a checked bag. 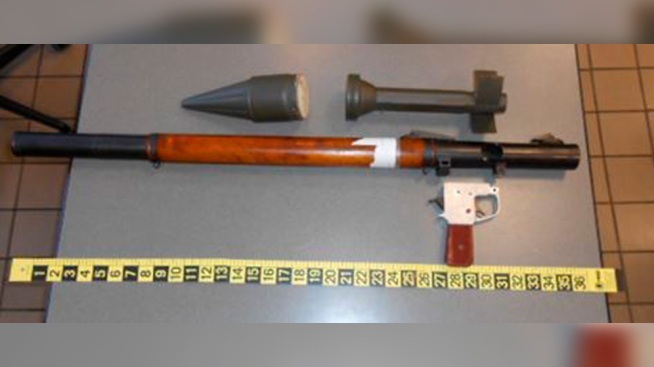 A Florida man's plans to bring a military rocket-propelled grenade launcher back home were shot down after security screeners at a Pennsylvania airport spotted the non-functioning weapon in his checked bag. The Transportation Security Administration says the unassembled parts of the launcher and a replica grenade were found on Monday when an alarm went off as the bag passed through security equipment at Lehigh Valley International Airport in Allentown, about 60 miles north of Philadelphia. TSA says no realistic or replica weapons of a military nature are allowed onto airplanes. CORRECTION (March 6, 2019,t 9:40 a.m.): This story has been corrected to show the screening group is called the Transportation Security Administration.